Today, the NHS has launched a tool that for the first time accurately measures the number of patients admitted to hospital who are at risk of sepsis, which is notoriously difficult to detect. Sepsis is a life-threatening condition that claims approximately 37,000 lives a year, although the exact figure is difficult to determine. It is caused when the body responds poorly to a bacterial infection and attacks its own tissues and organs. Sepsis is notoriously difficult to spot because there is no clear diagnostic test for the condition. For the first time, the NHS will now be able to track improvements – such as rates of survival and length of hospitals stays. Now all hospitals across England are being asked to use a tool which will allow them to identify how many patients are at risk of sepsis. “The NHS has made huge developments in tackling sepsis but it could still go further. “Not having an agreed definition of sepsis has made interventions difficult as the NHS has not been able to accurately report how many people are falling victim to this deadly condition or which treatments are most effective. The number of recorded cases of sepsis in the NHS has significantly increased in recent years thanks to better detection and reporting of the condition by NHS staff. But without a clear consistent definition of sepsis, it has previously been impossible to properly track improvements or accurately report on how many people are falling victim to this deadly infection. This NHS tool will for the first time measure the number of patients coming into hospital as an emergency with a severe bacterial infection categorised as of “suspicion of sepsis”. Previously the measurement for sepsis has fluctuated but this tool gives serious infections a defined category that all organisations in the NHS will use, identifying patients who should be screened for sepsis and giving clinicians the most accurate picture yet for how many people are at risk of developing sepsis. The tool will help spot whether these interventions are having an impact on patients locally, regionally and nationally. By showing the numbers of admissions, rates of survival, and lengths of stay, it will give clinicians the clearest information yet for which types of infections can cause patients to deteriorate quickly, and which treatments are most effective at saving lives. 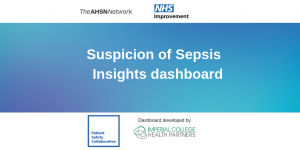 The Suspicion of Sepsis (SOS) Dashboard has been created by Imperial College Health Partners (ICHP) through the Patient Safety Collaborative, in collaboration with NHS Improvement and NHS England, and building on the methodology for measuring sepsis previously published by Oxford Academic Health Science Network. It was introduced on World Sepsis Day to Celia Ingham Clark, NHS England’s Medical Director for Clinical Effectiveness, alongside Care Minister Caroline Dinenage at Imperial College Healthcare NHS Trust. Changes in coding patients with Sepsis and increased Sepsis awareness has led to numbers of NHS patients identified with Sepsis to ‘increase’ artificially. Importantly even with this ‘increased’ awareness and coding changes mortality rates for all cause emergency Sepsis admissions have gone down. There were 2 million suspicion of sepsis admissions in England last year compared to 1.2 million 5 years ago. NHS Improvement is responsible for overseeing foundation trusts, NHS trusts and independent providers. We offer the active support these frontline providers need to give patients consistently safe, high quality, compassionate care within local health systems that are financially sustainable. By holding providers to account and, where necessary, intervening, we help the NHS to meet its short-term challenges and secure its future. NHS Improvement brings together Monitor, the NHS Trust Development Authority plus groups from three other organisations: from NHS England both the Patient Safety Team and the Advancing Change Team, from NHS Interim Management and Support two Intensive Support Teams, together with the National Reporting and Learning System team. NHS Improvement is an operational name for the organisation which formally comes into being on 1 April 2016.